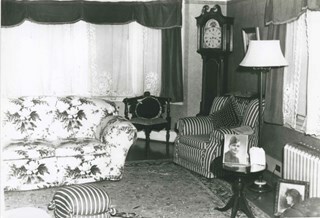 This home was built as a retirement home for Baptist Missionary Reverend James Black and his family in 1925; the Black family resided in the home until the early 1970s. 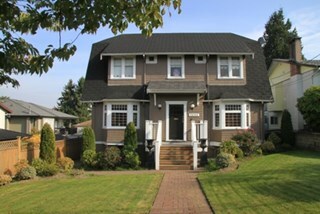 The Black Residence is a good example of the Period Revival movement that occurred between the two World Wars. 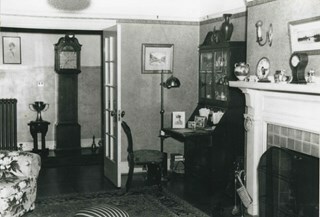 At the time, it was considered good taste for a house to have an identifiable historical style. 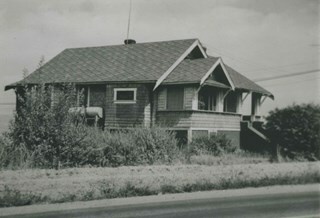 The Black Residence was likely designed by a local architect or built by a contractor using a pattern book plan, and the British Arts and Crafts influence was typical of many middle class homes of the period built in Burnaby. The house was originally located facing Sardis Street with a beautiful garden landscape that was lost when the house was relocated in 2005. 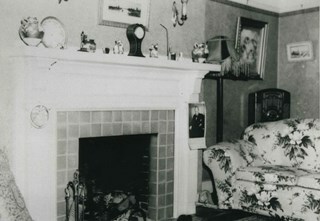 Photograph of Alice & George A. Grant standing on a paved walkway, arm in arm. 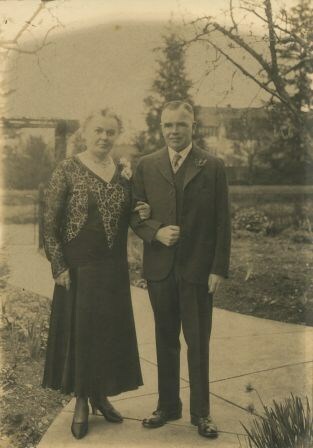 Alice Grant is wearing a dress with a corsage at her shoulder and George Grant is wearing a three piece suit with a flower in his lapel. Kingsway West school is visible in the background. 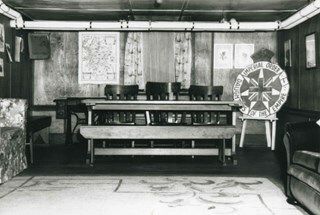 Photograph of a Kingsway West School class, Division XIV. 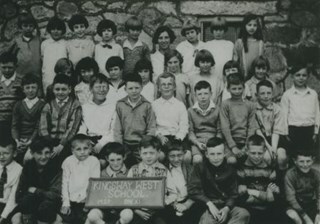 Photograph of a Kingsway West School class, Division XIV (14), Grade 4. Identified: (top row, 5th from left) Murial Morash; (top row, 6th from left) Miss Grimwood (teacher). 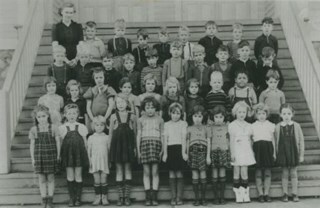 Photograph of a Kingsway West School class, Division XII (12), Grade 3. Identified: (top row, 3rd from left) Murial Morash. The teacher is Miss Dorothy Black. 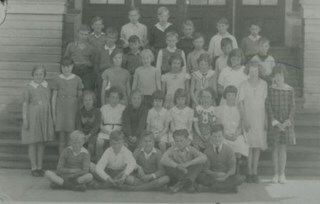 Photograph of a Kingsway West School Grade 4 class. 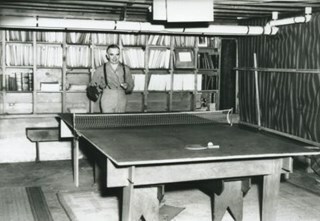 Ralph Morash was in this class but is not identified. 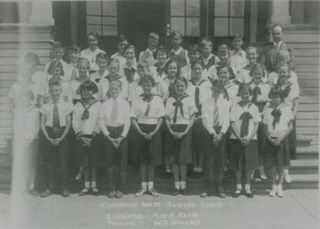 Photograph of a Kingsway West School (originally named West Burnaby School) choir. Identified: (back row, left) Miss A. Adair (conductor); (back row, far right) Mr. W.S. Wallace (principal). Photograph of a Kingsway West School class Division XV (15). This is a Grade 3 or 4 class. 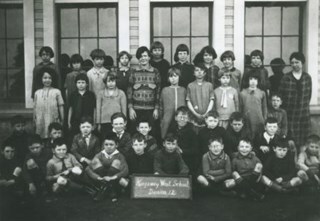 Identified: (front row, 2nd from left) Ralph Morash; (right, standing) Miss Bodley (teacher). 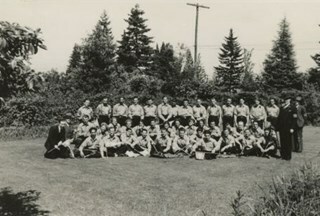 Photograph of Kingsway West School (originally named West Burnaby School) senior class and teachers. 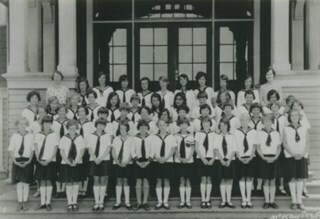 Photograph of Kingsway West School choir. The pianist was Miss Setter. 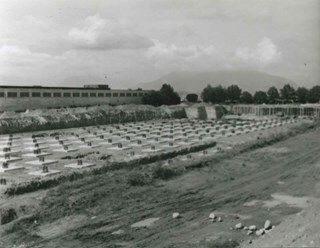 Photograph of the beginning of the construction of Simpson Sears. 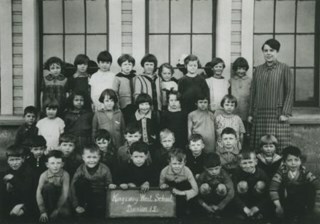 Photograph of a Kingsway West School Grade 1 class. 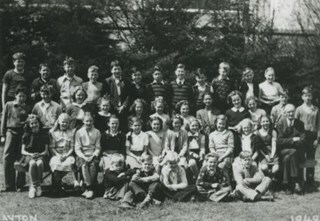 Identified: (2nd row from top, 4th from left) David Price; (top row, left) Miss Crossfield (teacher). 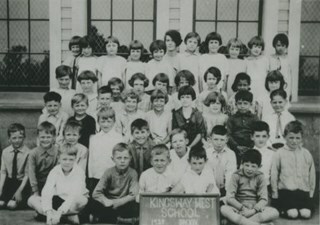 Photograph of a Kingsway West School class. 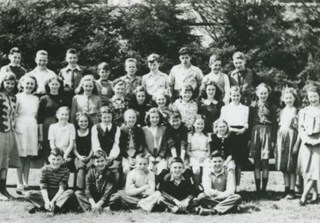 Photograph of a Kingsway West School Grade 6 class. The teacher is Miss Black. 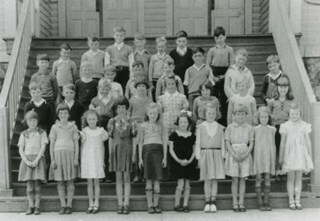 Photograph of a Kingsway West School Grades 5 and 6 class. The teacher is Mr. Stinson. 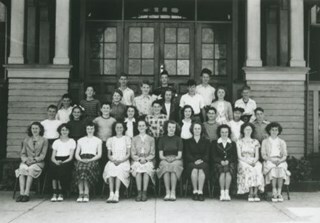 Photograph of a Kingsway West School Grade 8 class. Identified: (top row, far left) David Price, (2nd row from top, 3rd from right) Ron Eeles. 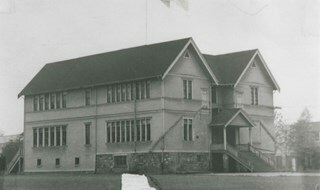 Photograph of the exterior of Kingsway West School. 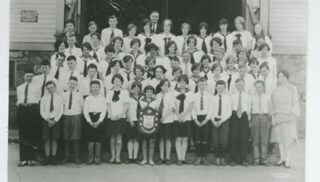 Photograph of a Kingsway West School choir with a shield they had won in competition. Identified: (back, centre), W.D. 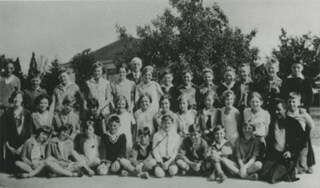 Blair (principal), and (front, right) Miss Rose Mould (music teacher). 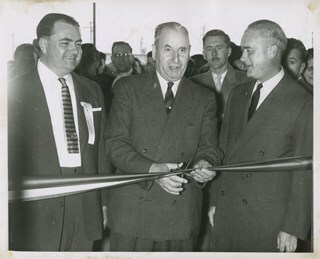 Photograph of Charles MacSorley (left) speaking into a microphone at the opening of Simpson-Sears. 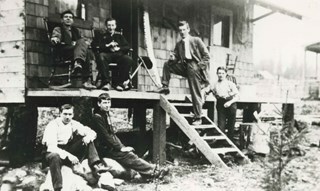 The man standing to the right of Charles is identified as Mr. Haskell. 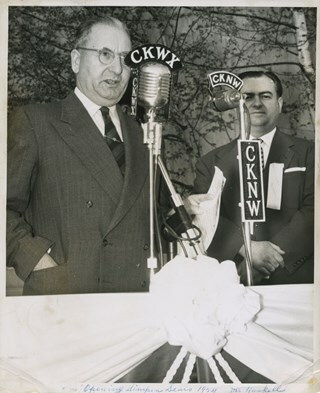 The microphones have the call letters CKNW on them. 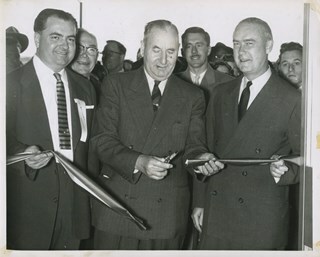 Caption on recto reads: "Opening Simpson-Sears 1954 Mr. Haskell"
Photograph of Charles MacSorley (centre) and two unidentified men at the Simpson-Sears ribbon cutting ceremony. 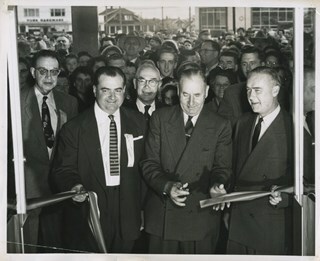 Photograph of Charles MacSorley cutting the ribbon at the opening of Simpson-Sears. A large crowd is gathered behind him. 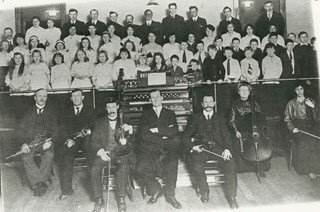 Photograph of the choir and orchestra at Henderson Presbyterian Church, West Burnaby. Thomas Shankie is in front of the organ. 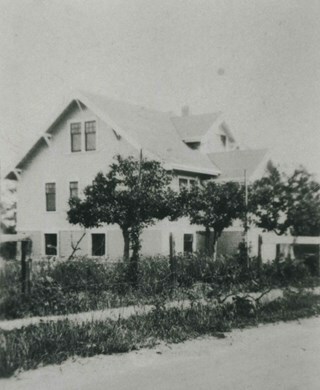 Photographic postcard of the Jubilee Methodist Church. 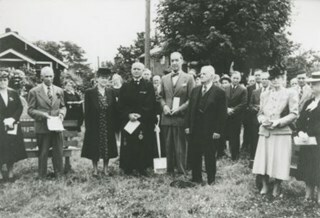 Photograph of Dr. Laite and members of West Burnaby United Church, possibly on the occasion of the turning of the sod for a new church building. 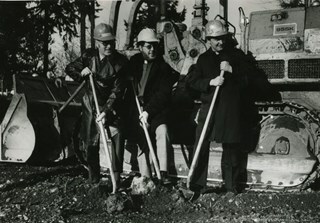 Photograph of Reverend George Morrison of the United Church, Reverend Donald Grayson of the Anglican Church, and Father Dennis Luterback of the Catholic Church with hard hats on and shovels in their hands. They were participating in the sod turning ceremony for the then new combined care facility for seniors being built by St. Michael's Centre Society in South Burnaby. Newspaper clipping attached to verso of photograph reads: "DIGGING IN ... Sod turning ceremony for new 80-bed combined care facility for seniors being built by St. Michael's Centre Society was held recently. 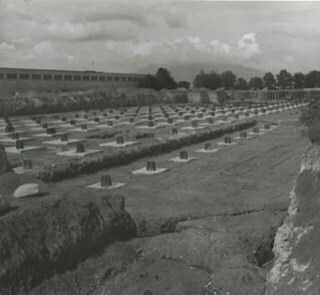 Participating in ceremony were, from left to right, Rev. George Morrison of United Church, Rev. Donald Grayson of Anglican Church, and Father Dennis Luterback of Catholic Church." 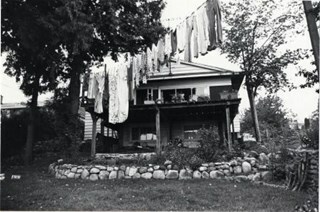 Photograph shows laundry on the clothesline in the backyard of the house at 8031 Sussex Avenue near Winnifred Street. 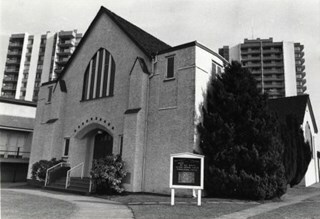 Photograph shows the West Burnaby United Church located at 6050 Sussex Avenue on the corner of Sussex and Hazel Street. 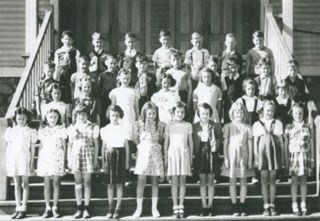 Photograph of Kingsway West School class standing and sitting in rows outside, on the steps of the school. Accompanying identification keys note the following: In the back row are; unidentifed, Gordon Simms, Jack Blain, Jack Casey, Norman McKenzie, Jack Hogg, and Gordon Sutherland. In the third row are; Boris Karpeza, Billy Taylor, unidentified, Grant Smith, Terry Forman, George Flett (was bus driver [sic] ) unidentified, and Kenneth Coburn. 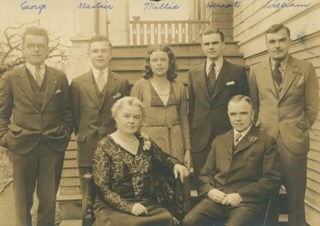 In the second row are; Donald Noyes, Bud Thompson, Gilbert "Albert" Brown, Joyce Campbell, Vera Jackson (Pel), Rosemary Hawthorne, White, and Ethel Wynn. In the front row are; Joyce Sheane, unidentified, Beatrice Doine (Mrs. Bea Rodda), Colleen Cooper, Winnie Goss, Jeanette Cruickshank, Faye Greveling, Evelyn Lindsey (Mrs. Dave Hughes), Hannah Frith, and Lois McCann. 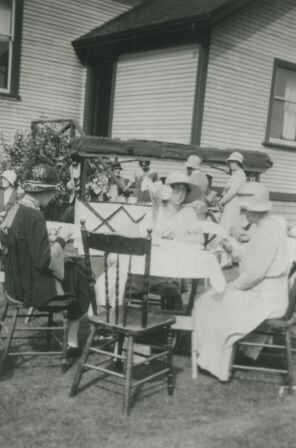 Photograph of the West Burnaby United Church Strawberry Tea being held outdoors. 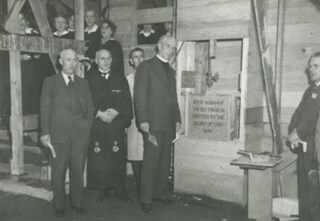 Photograph of the laying of the cornerstone of West Burnaby United Church. The cornerstone reads, "West Burnaby United Church Erected to the Glory of God 1948." 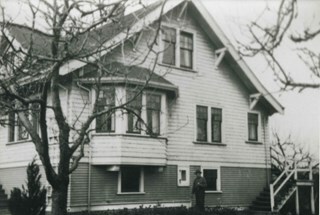 Photograph of the Mayhew family home at the corner of Edna Street (now Grange Street) and Sussex Avenue. 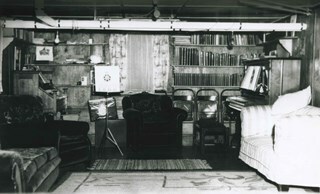 Ann and Edward Mayhew lived here with their two daughters: Edna Jean and Margrett Ellen. 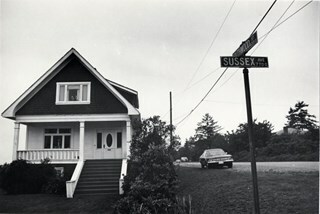 Photograph shows a house at 7715 Sussex Avenue on the corner of Southwood Street.